My Comment: The education system doesn’t bear fruit because it is not connected with the system of upbringing, and without it the crisis is felt more deeply in all the layers of society. The time will come when even businesses will not be able to operate without uniting all the employees in one team, in mutual responsibility. Weaving the method of unification in all occupations is becoming more obvious with each day. There will come a time when a necessary condition for success in all actions, as individuals as well as any groups, will be unity, and unity and will precede actions. Thus, the upper authority will force humanity to learn intentions before actions and will lead everyone to Itself. In the News (from The Telegraph): “Sudden, jarring changes in pitch and frequency play on the same emotional mechanisms as the signals which animals use to alert one another of danger, a study found. “When animals cry out in distress they force a large amount of air through their voice box very quickly, producing a discordant effect designed to grab the attention and provoke an emotional response in other animals. “Hearing similar sound patterns, like Hendrix’s distorted version of Star Spangled Banner at Woodstock in 1969, sends a shiver down our spine because we are programmed to react strongly to the harsh noise, researchers said. “The same goes for discordant music associated with horror films – such as the screeching soundtrack to the shower scene in Alfred Hitchcock’s Psycho – but not for generic ‘elevator music’ which lacks jolting changes in sound or volume. “Researchers also found that while dissonant music stirs up strong emotions, these are usually linked to negative feelings like fear or sadness rather than happy ones. “Greg Bryant, assistant professor of communication studies at the University of California, Los Angeles and one of the study authors, said: ‘This study helps explain why the distortion of rock-and-roll gets people excited: It brings out the animal in us. My Comment: In the process of integral education, we have to use the appropriate musical influence as the background for conversations and during the workshops. We need to encourage and increase listening to songs with “integral” content. My Comment: Egoism lies consciously and unconsciously because it needs to see benefits for itself in everything, and only this counts. The correction is to change values. The value of honesty and the possibility of spiritual elevation, must become valued more highly than normal cheating. 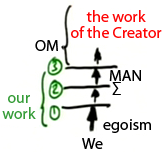 However, only striving for the highest reward, to become closer to the Creator, can protect from natural egoism. The model for the exchange of information between teacher and student emerged in the industrial era. Although the world has changed, schools continue to pretend that they still are preparing the workforce for factories. The primary skills learned are discipline and obedience. The main structural component is the classroom. One teacher lectures a general lesson to all the students that everyone needs to grasp simultaneously. Such a system is suited for preparing people to work on an assembly line. Since then, it hasn’t changed. Today, the old system no longer works. We need drastic changes, but any department of education is entirely restricted within a framework of laws. Teachers are afraid of losing their jobs. Parents believe that, at least in school, their children are in a safe state. Thus, the only ones who still have the possibility and the potential to change the situation are us! The reason for that is that if people driven by egoism find something in this wisdom, they will not be able to advance. In another article, Baal HaSulam brings the example of an unripe fruit that can harm a person. Answers that are received without exertion, without self-advancement, only block a person’s way. The wisdom of Kabbalah is revealed gradually, so that a person would understand more according to his internal spiritual growth, and thus advance. However, if he received the answers in advance, without growing and developing a vessel, it would stop him and not allow him to advance. Then he wouldn’t need to change and to acquire new attributes, and it would prevent him from discovering the way to the spiritual world by himself. This is why Kabbalists took great care not to reveal things that people are not yet able to understand. The wisdom is acquired according to a person’s readiness. We study in order to summon the Light that Reforms, and when it corrects us, we begin to understand and to feel the material that we study. The process is as follows: We connect in a group of about ten people, and then by the power of our unity we can raise MAN to the upper force. As an answer, we receive the Light that Reforms, which means the Surrounding Light (Ohr Makif – OM). This is what changes us, meaning, truly unites us (∑) and corrects us, and thanks to this correction we discover the upper world in our corrected attributes. We discover the upper reality. 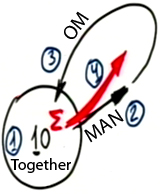 If we don’t perform the two initial steps, connecting and raising MAN, then nothing happens. Therefore, Kabbalists wrote their books in stages, according to our advancement in our study. When we read it for the first time, we discover our ego. Then we understand that there is only one choice, to rise to unity (∑), and then we discover that it isn’t enough either and that we have to raise MAN. If we do that then the Upper Light, the Surrounding Light (OM) completes the work. Question: Should we offer supporting study materials for the courses in integral upbringing? Answer: I think that the basic course should teach people to unite practically. And, the next course, which prepares instructors, should include everything. We need to provide a future instructor with various systematic materials on every topic with a bibliography and other data. Everyone needs to have a folder from which he could draw solid, compelling information at any given moment to demonstrate, convince, talk about, and teach. He has to be able to use this. Question: I am actually only an animalistic body and I don’t have a “soul” yet. How do I acquire it? Answer: A soul is part of the Creator from above. It is bestowal; it is the level of Bina, the level of general love. If you acquire this attribute, it means that you have received a part of godliness from above. “From above” means that you consider the value of bestowal and love as higher than all your other beastly desires. If you acquire this part of the attribute, it means that you have received a soul. Why? It is because, with this part, you will be able to love others and to bestow upon them. You will feel a different world, the next world, something that is external to what you are feeling now. Every sphere that you are feeling now, as if you were in it and which surrounds you, is a sphere that you feel inside your ego. If you acquire the attribute of bestowal, it is as if you exit this sphere and enter an upper sphere that is external to you. You get an extra corporeal feeling, a special emotional state (extra sensory), and then you begin to discover the upper world, thoughts and desires that are aimed fully at bestowal and love. This is called an “addition” above the five senses with which you currently depict this world: sight, hearing, taste, smell, and feeling. You add extra senses to these five senses, which operate in bestowal, called Keter, Hochma. Bina, Zeir Anpin and Malchut in which you feel something else that is totally in bestowal. The new structure that you have acquired begins to take on the form of Adam, which resembles the Creator. Now, you exist in an egoistic sphere called “this world,” you feel everything only within your ego, and this is your life. Suppose you expand yourself all the way to some external sphere. What you would feel in it is called the upper world. So, the vessels that you acquire along with that, the desires and the thoughts, are called Adam, the one who resembles the Creator. The Light that you attain in these vessels, the filling, is the Creator, the attribute of bestowal and love. Then, you attain an even greater world, the next level, and thus you advance up 125 degrees. However, there, you already have an upper mind and feelings that help you understand what is going on. 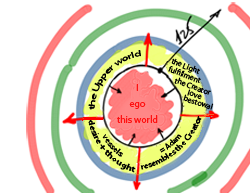 The main thing is to exit the first sphere because its nature is aimed totally inward, and it is opposite to all the other spheres whose nature is aimed outward.